Think of your tabletop as a blank canvas — your dining table is often the centre of the room, so let's make it the centre of attraction. Try not to let it sit empty, it’s a great place to express your personal style and showcase some fun decor from the current season. 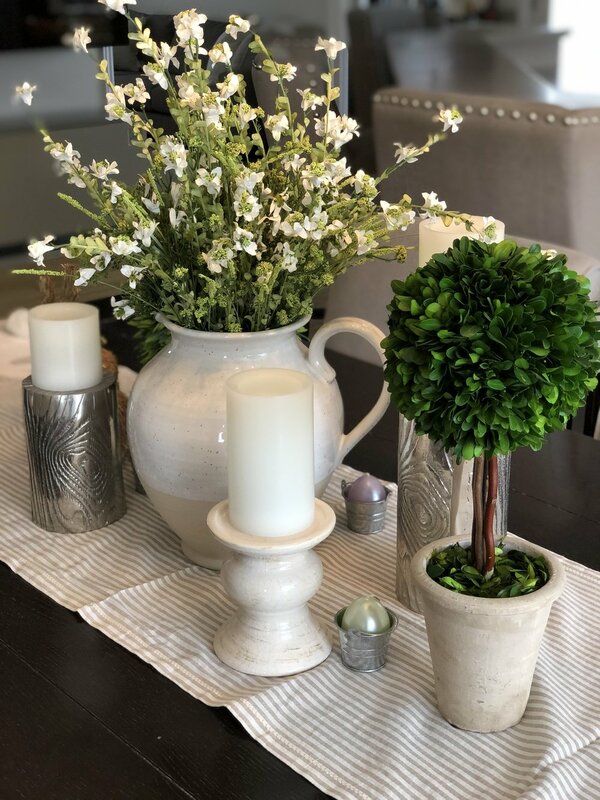 Spring has finally arrived and it’s the perfect time to switch up your table decor. And even though it’s a few weeks away, it’s definitely not too early to decorate for Easter. It’s the perfect excuse to add some seasonal florals to your home. When decorating your tabletop, always have a focal point. Start with the tallest item in the centre of the arrangement and work your way out to the smallest. This allows your eye to land on the centre of the 'scape. Try not to keep everything in a straight line. Your table is perfect place to display the things you love. It’s always nice to add a little ambiance, so think about incorporating candles. When grouping items on your table it’s best to use odd numbers instead of decorating in pairs. For example; 3 or 5 candles. Last but not least: never use scented candles on a dinner table. It will take away the smell of the great food you are serving.